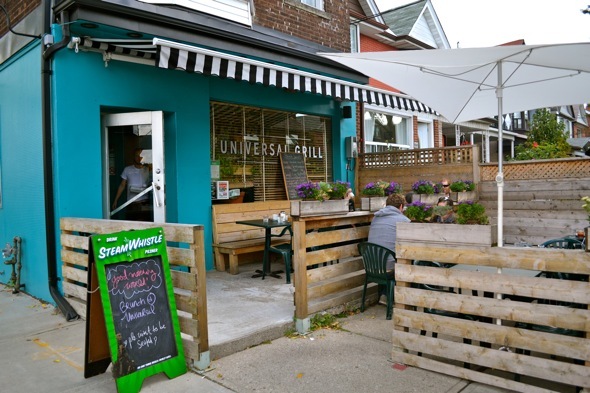 Universal Grill is a cherished gem at Shaw and Dupont, located amongst the surrounding residential, and somewhat industrial neighbourhood. 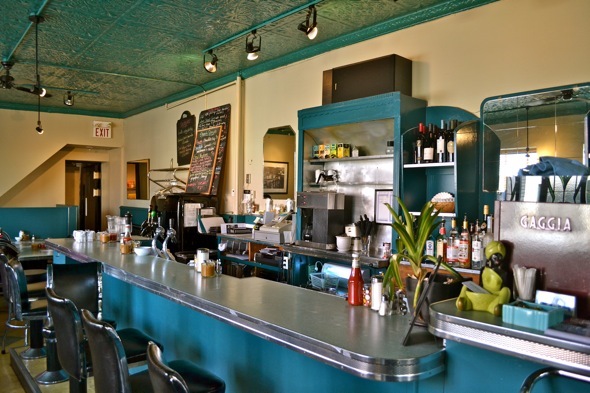 We indulged in a leisurely Sunday brunch outing, arriving just before 11am. We got there just in time, the brunch rush followed us and filled the restaurant (and some of the patio) less than fifteen minutes later. We made good use of the coffee menu while we waited, ordering a drip coffee ($2.95), a cappuccino ($3.50) and two Americanos ($3). Surprisingly the drip coffee was the winner this round, as the espresso based drinks were weak in flavour, hardly matching the rich, bold body found in the refillable drip option. A restaurant well-known for its Huevos Rancheros ($12 - top photo) ordering this item was a no-brainer. Other selections were not so easily made, as the Black Angus Steak 'N' Eggs ($15) and the Potato Latke ($13) were viable options that eventually went unordered. Soon our chosen items reached the table, one by one, all mouth-watering in their beautiful presentation. First, the popular Huevos Rancheros. Living up to high expectations, the dish was the perfect conversation of flavour and texture. Maintaining a spicy kick throughout, the fusion of eggs, beans, salsa and crispy tortilla made for a hearty and appealing breakfast, good to the last bite and complimented by the sour cream and guacamole sides. Next to arrive were the Chocolate Chip Pancakes ($11), one of the daily specials. 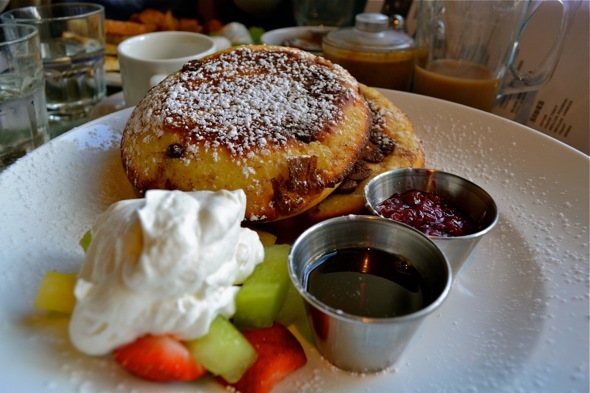 Baked in in cast-iron dishes, the pancakes were fluffy and thick, while buttery crisp on the outside. The tasty raspberry compote was a perfect compliment to the chocolate chips, making this a deliciously sweet option off the menu. The next dish was a variation of the menu item, Cheesy Scrambled Eggs ($8). 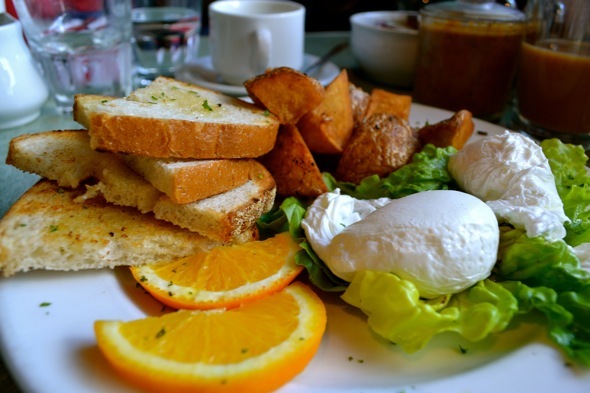 We opted against the cheese, and went for poached eggs, served with potatoes and toast. The poached eggs arrived perfectly medium as requested, and the potatoes were simply delicious, not battered down by complicated seasoning. This meal was a perfect companion for the delicious house-made hot sauce found at the table. Last to arrive was the Omelette of the Day ($11), featuring mushrooms, spinach and cheese. The stuffing was perfectly proportioned, allowing each ingredient its dignity without overpowering the dish. 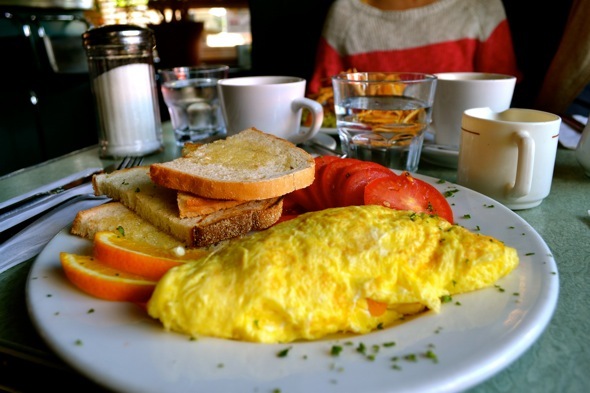 The eggs were fluffy and flawlessly cooked, avoiding the runniness that is sometimes the culprit of other breakfast venues. The dish is normally served with potatoes but we substituted for tomato and were pleased to find a generous portion of fresh and flavourful tomato arrive on the plate. 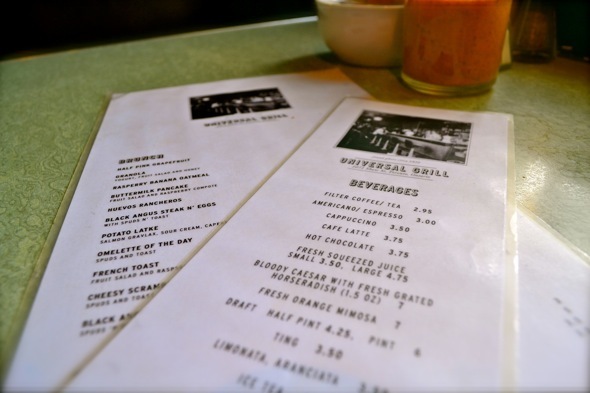 The Universal Grill is cozily decorated in diner-kitsch, not pretentious in its ambiance and laid-back atmosphere. Although the service was sometimes a bit tardy (we waited quite a time for the Visa machine on our way out, and in between drink and food orders), it makes up for it with the value and quality of the food served, as well as the flexibility when it came to substitutions.